Decks deteriorate over time. Of course! But, the deck contracting business is filled with less than brilliant individuals, hack carpenters that think they are qualified to be contractors and slimy individuals, that are just out to make a quick buck. Many don't take deck building very seriously. (Frank takes deck building very serious! Click here.) They own some tools and have a little know-how. 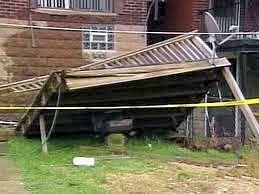 This is why we are seeing more decks collapsing around the country. Even if an inspector comes out for a framing inspection and gives more than a cursory glance (not usually) he cannot protect you from shoddy workmanship! There are numerous ways that a contractor can short change a job. When the guy that was hired bid the job at 20% less than another, he has to make up some of the difference in "lost" income. (Example) Your deck gets five soon-to-be corroded undersized bolts instead of fifteen ½" hot-dipped galvanized bolts. Or the all important ledger doesn't get caulked or properly flashed at the end joists, allowing moisture entry and over time, rot to your homes structure. These are just a couple of examples of easily missed yet critical elements to a well constructed deck. - Frank Lamphere of A-Affordable Decks in Lombard, Illinois. Frank Lamphere, owner of A-Affordable Decks of Lombard, Illinois in his 25th year of business and whose specialty is wood and vinyl deck construction and repairs says "Whenever you build or make structural repairs to a deck, it is important to make sure that the repairs are done by an expert. Also, obtain the required permits (if required) to help ensure your family and guests enjoy your deck without worry of failure or collapse". 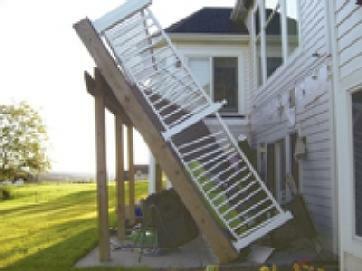 As a home owner there are some simple things you can do which may help prevent unexpected problems with your deck. Use the checklist below to help you inspect your deck for possible unsafe conditions. 2. 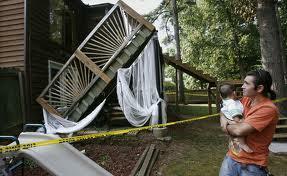 Closely check the attachment points between the deck and the house. Is a Comprehensive Deck Inspection for you? I will even recommend the best solutions to all of your deck's ills. Guess what? The builder didn't connect the deck to the house the right way. He most certainly didn't "flash" the deck properly.